There were a lot of bands in the "Myspace" days of christian metal. Some were fantastic, and released some very solid material. Some were awful. Some produced numerous albums, and many just released one EP, and called it quits. And one or two produced some near-genre-defining masterpieces that should never be forgotten. 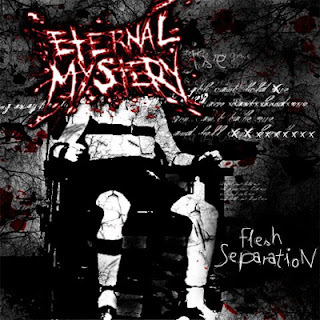 I am daring to say that Eternal Mystery's Flesh Separation is one of those albums. Flesh Separation was the last album released by the 1-3 piece Christian Death/Grind band Eternal Mystery. And boy, what an album to go out with. By this point, the band had 3 members (for the first time in years), and each showed quite a bit of skill. Broc Toney, the only member of the band who stuck around from sweet beginning to quiet end, did guitars and drum programming. Josh Cook, who had been with the band since their Split with the Right Wing Conspiracy, did vocals. Shane Carter (who was only 15 at the time!) played bass. Every track in this album has something distinguishable in it. The opening, track, Intro, starts out with some instrumentals, and ends with a short quote from the movie 300, gracefully cross-fading into the first vocal track, Bile of the Dictator. Josh's vocal skills really shine in this track. He took the same mid-high and mid-low skills used in Their Split with Right Wing Conspiracy, and really expounded upon it. Broc's guitar work is exactly what you'd expect. Down-tuned and very solid. And his drum work pretty well follows suit. Expect to hear plenty of sweet cymbal work, and insane double bass pedal-ing. Shane's bass work is quite impressive, especially for someone who was only 15 at the time. Pay extra attention to the beginning of "A Walking Tomb", which has several moments with just bass and a couple of cymbal crashes. Two particular tracks to mention are Flesh Separation and Tongues of Scorn. Flesh Separation could easily be considered the "excited" track from the album. You'll just have to listen to it to understand. The big note here is the fact that Felipe Diez (who has appeared in virtually ever Broc Toney Project) has some guest vocals in this track. Tongues of Scorns starts out with some nice, general death/grind. But after about 2 minutes, it goes silent...yet, the track isn't over yet. Skip ahead to 5:40. You're then greeted with a very mellow/solemn instrumental sequence. It's simply amazing. Just give it a listen. The last thing I want to note is more for the audiophiles, so feel free to skip ahead if you want the wrap-up. The stereo spacing in this album is great, especially for a home project. Some parts of the album tend to sit in the monophonic range. But some parts of some tracks, especially the beginnings, do really well at bouncing from ear to ear, or just separating instruments in a very enjoyable way. Make sure your favourite pair of studio phones, and give this one a listen in a lossless codec. More could be said about this album, but I won't say it. Go give it a listen. You will most likely be finding a digital copy, since this album is long out of print. If you do find a cd copy, hold on to it and cherish it deeply. It's simply a fantastic album.